In der isländischen Tragikomödie Sture Böcke müssen sich zwei verfeindete Brüder zusammenraufen, um das zu retten, woran ihr Herz am meisten hängt: ihre Schafe. In einem Tal Islands leben zwei Brüder. Sie hüten Schafe – aber haben seit 40 Jahren nicht miteinander gesprochen. Gummi and Kiddi leben als Nachbarn in einem einsamen Tal auf Island, wo sie sich um ihre Schafe kümmern. Ihr angestammter Schafbestand gilt als einer der besten des Landes, und die beiden Brüder werden immer wieder für ihre Schafböcke ausgezeichnet, die eine lange Abstammungslinie aufweisen. Obwohl sie Land und Lebensweise teilen, haben Gummi und Kiddi seit vier Jahrzehnten nicht mehr miteinander gesprochen. Als plötzlich Kiddis Schafe von einer tödlichen Seuche befallen werden, ist das ganze Tal gefährdet. Die Behörden beschliessen, alle Tiere aus der Region zu keulen, um den Ausbruch der Seuche einzudämmen. Für die Bauern, deren Haupteinkommensquelle ihre Schafe sind, kommt das einer Todesstrafe gleich. Viele von ihnen verlassen ihr Land. Doch Gummi und Kiddi geben nicht so leicht auf – und jeder der beiden Brüder versucht das Unheil auf seine Weise abzuwenden. Kiddi, indem er sein Gewehr benutzt, und Gummi, indem er seinen Verstand einsetzt. Als die Behörden näher rücken, müssen sich die Brüder zusammentun, um ihre besondere, seit Generationen bestehende Zucht und sich selbst vor dem Untergang zu retten. What was your inspiration for telling the story of two estranged brothers and their sheep? My film is based in large part on my own experiences with rural people and rural culture in Iceland. Both of my parents were raised in the countryside and I was sent there to live and work most summers until I reached the age of 17. Because of this background, I think I have a certain sense for the stories, characters and visual language of these rural parts of Iceland. I’ve always been attracted to stories from the countryside and RAMS isn’t the first film I’ve shot in this environment. My father also used to work for the Ministry of Agriculture, and so that was a source of insight into how the administration around farming works, and how agriculture has changed and evolved over time. One of the hardest things my father ever had to face in his professional life was making decisions about whether certain livestock should be slaughtered – or not – in the event of an outbreak of disease. In the north of Iceland, as in other rural parts of the island, sheep farming was a central part of people’s livelihood as well as their culture, all the way up until the last years of the 20th century. So in a way the Icelandic sheep was and still is holy to a lot of people: it represents pride and the “old way”, the way people used to be. Sheep have played a pivotal role in rural survival here over the centuries, and they are deeply rooted to this land and closely connected to the Icelandic spirit. Our country was build on fishing and farming and in Bardardalur, where we shot RAMS, sheep farming is still the main employment. But beyond farming, there is something special about sheep, and most farmers I know have a stronger connection to sheep than to other domesticated animals. Farmers who run a mixed farm – raising cows, sheep and horses – are usually most interested in the sheep. The cows might put bread on the table but the farmer’s main “hobby” and passion is usually their sheep. Somehow the relationship between man and sheep has always been particularly close, and I found that phenomenon interesting and intriguing. This is the world I wanted to depict in the film. People who live alone with their sheep, in nature, and develop very strong emotional connections with their animals. This is something that’s becoming very rare in modern society, and people like my main characters Gummi and Kiddi are dying out. I think that’s a shame. I like eccentricity and peculiarity to a certain point, and I would like that to live on, even in modern society. Conflicts between neighbours are very common in the countryside in Iceland. Personally I know of many instances where people living side by side fall out and still have not spoken a word to each other many decades afterwards. Often they even forget why they are enemies in the first place. Icelanders are stubborn and autonomous people, they want to stand on their own two feet and they distrust everything that comes from the outside. There’s a streak of independent thinking that sometimes goes beyond all logic. The reasons for dispute are many, but most often people argue about land, inheritance or romantic matters. It’s a very tragic state of affairs when people are living in very isolated places, part of very small communities, but can’t speak to their closest neighbor. And at the same time I find this situation quite comical. I know several bachelor-farmers who live alone. In farmers’ families, the sons tend to take over but the daughters move away. The sons get stuck at the farm and have very limited possibilities of finding a woman or any kind of companionship. Two brothers living side-by-side in a hinterland valley, but not speaking to each other. They have nobody to talk to except their animals, but their pride is too strong for either of them to give in. It’s a good set-up for a tragi-comic film, or a drama filled with dry Icelandic humor, and that’s exactly the kind of story I’m personally drawn to. How did you learn about the disease known as ‘scrapie’, and decide to make it a narrative catalyst for RAMS? Scrapie (BSE) is the most harmful disease the Icelandic countryside has ever had to face. It’s an incurable virus that attacks the brains and spinal cords of sheep and is highly contagious. The disease originally spread to Iceland through British sheep that arrived in the late 19th century. So far it has not been possible to eradicate it completely. This winter we saw at least three cases of scrapie in Northwest Iceland, so it’s very current and still scares people. I know farmers who have suffered because of scrapie and I know the mental trauma that results when the entire stock needs to be slaughtered. Scrapie infected my niece’s sheep stock and it was a big emotional shock for her and her husband. I experienced firsthand how this affected them psychologically. They have many children and they also cultivate cows and horses, so it was not like they lost absolutely everything. But I started to think how it would feel for someone who lives alone, and who only has sheep, to be forced to slaughter the entire stock. In RAMS, an outbreak of scrapie sets the story in motion. The brothers find they have a common interest and a common goal: the ancestral sheep stock. They are two human beings trying to save what’s most important to them from destruction. Because for a farmer there is absolutely nothing worse that can happen than losing your livestock. I think that’s a story many people can relate to beyond Iceland, and I wanted to embrace it in the film. How did you balance different genres, in order to find both humor and deep humanity in such a harsh environment? Rams could in some sense be considered a very Scandinavian film, being a cocktail of drama and black humor. I’ll admit that my own humor is pretty dry and that definitely affects my films. 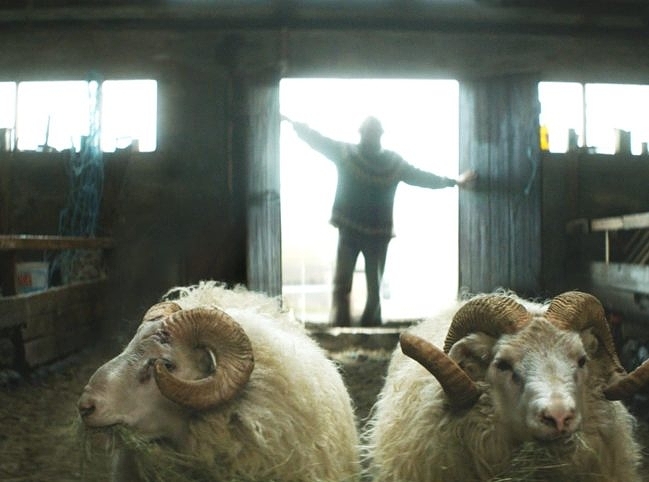 I think RAMS could be compared with certain recent Nordic films, Bent Hamer’s KITCHEN STORIES and NOI ALBINOI by Dagur Kári to give a couple of examples. But even if RAMS can be seen in the vein of dry comedies, I wanted to tell a more universal and relatable human story. The thriller element that comes into the film wasn ́t planned originally, but I think because the stakes for these characters and their way of life are so high, people who see the film experience it as such. As I developed the script, I carefully brought the suspense into it, but only because I thought it made the movie more interesting. How did you cast and work with your two memorable lead actors, along with the many rams and sheep in the film? I wanted actors that the audience would relate to, and Sigurður and Theodór are among the most respected actors here in Iceland. In order that the characters be credible and really come to life on the screen, I put a huge emphasis on getting them to understand the state of mind of the farmers. There are certain archetypes behind Gummi and Kiddi and it was very important that my actors meet the people in question. So they got acquainted with sheep farming through academic research as well as personal experiences ‘on the ground.’ I also produced a detailed back-story for them both to study and integrate into their roles. Since conversations and dialogue are quite limited in the film, it was a necessity that these two characters be strong and interesting as individuals, and the actors had to be capable of giving very physical and intuitive performances. We had a “sheep rehearsal period” for several days, where we only rehearsed scenes with sheep. We shampooed the ram and everything. Sigurður Sigurjonsson worked on a farm when he was a teenager, so he was already familiar with the farming life. Theodór Júlíussn also had some experience, but both of them have been living in the city most of their adult lives, and they did need a little training. Casting the sheep was also quite an adventure that required some preparation and foresight. Some of my fondest memories of the film, from the pre-production period, were the auditions we held for the sheep. It turns out that sheep’s temperaments vary greatly between farms. On one farm we went to, the sheep weren’t at all docile, and they ran away from us as soon as we tried approaching them. But after a lot of searching we ended up at a farm called Halldórsstaðir where Begga, the farmer there, treats her sheep with love and affection. The rams there came right over to us and gave us a nudge as if they wanted a little scratch behind the ears. These sheep were great to work with, in fact even easier than working with actors. A local farmer from Bardardalur, Magnus Skarphédinsson, was our sheep trainer, and he did an amazing job. If ever they decide to give awards to animal actors in films, I am certain that our sheep are among the most deserving, and that they will go home with a few statues.